These MACarbon seat belt buckles have been a bit of a headache for me. I had to modify the covers for the two rear buckles before they would fit. A recurring warning light forced me to replace the front passenger side buckle altogether. And then the new buckle promptly “broke” apart (the two parts of the housing separated and it’s much worse where the belt is attached and there’s tension). I’m not sure if I’d buy / install these parts again. Regardless, I’m a guy that looks for solutions. The first thing I tried was epoxy. I glued the halves back together but they came apart again shortly after transporting a passenger. 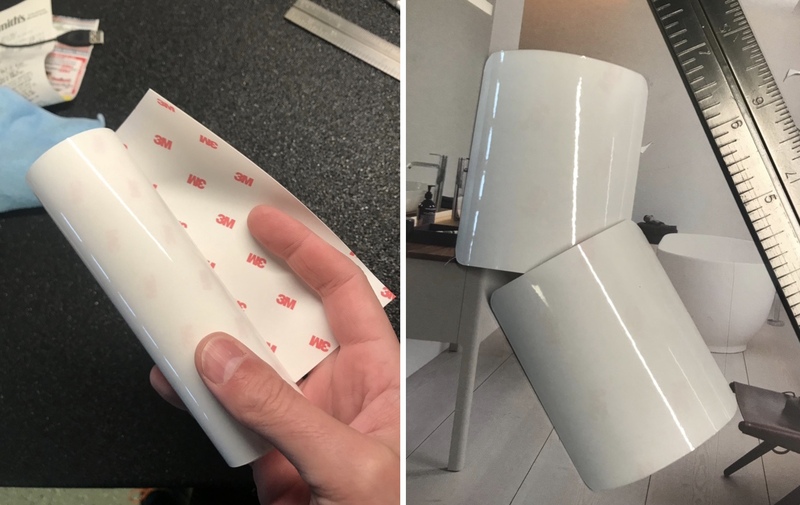 I considered a number of different options before settling on some 3M adhesive- the same stuff you might cover the exterior of your car with. I cut out a couple of sections and did some test fitting. Originally I had just intended the fitting to be temporary but the 3M seemed to be exceptionally strong and the installation went fairly well (you can see the lines in the pictures but in real life it’s very hard to see where the film is at all). One of the back seat belt buckles also had a case that was coming apart so I applied the 3M there as well. I suppose my next step will be to see how well the film works over the coming months (I’m worried about its ability to stick and the potential of stretching). 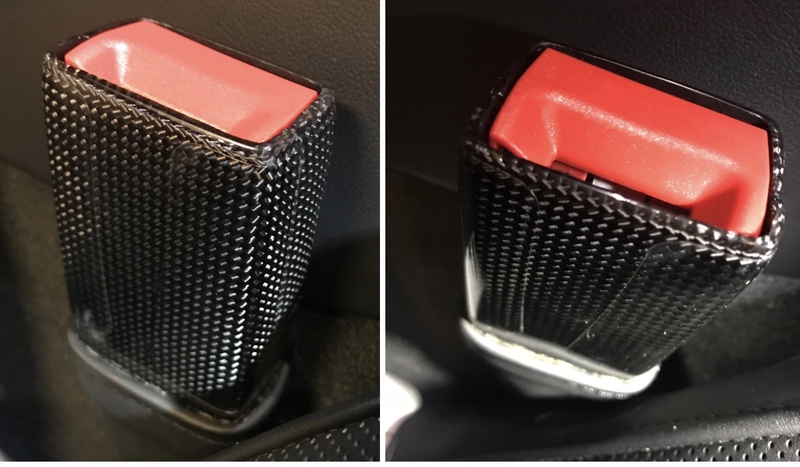 In the meantime this appears to be a quick and elegant solution for anyone with a similar problem (and not just limited to seatbelts folks– you can wrap this clear 3M film around pretty much anything). It’s been awhile since I made this adjustment, but I wanted to a second and memorialize just what I’d done. It’s probably been a year since I first noticed the bumping noise coming from behind me. It was a rapid and systematically occurring thumping sound aggravated by uneven roads. I accused the seats, seatbelts, various tools stored in the back of the car and even my imagination before I finally found the real culprit. 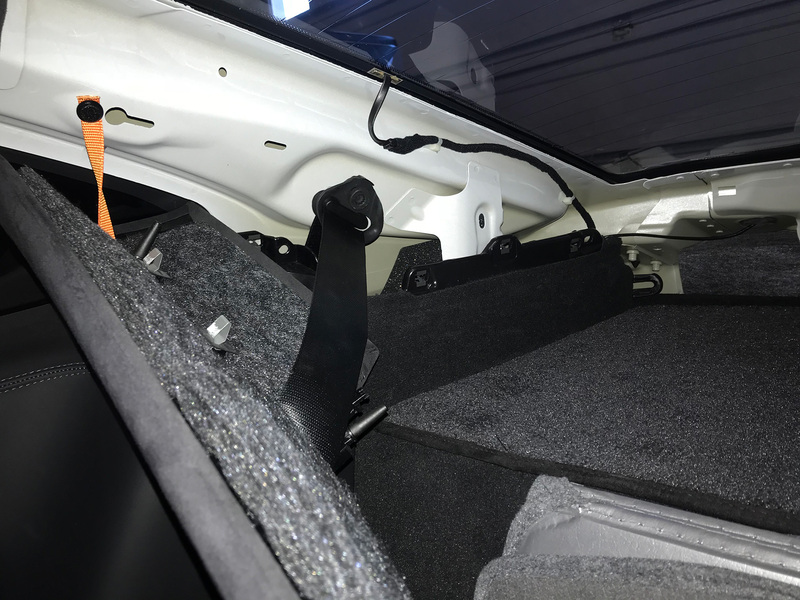 I wedged myself into the back seat and tapped on everything until I finally discovered a piece of interior trim knocking against the car’s frame. For context: You’re looking at the A-pillar that holds the rear right seat belt (the belt is still attached to the frame). The back window of the car is visible in the top-right. Removing the interior trim along the right A-pillar was unpleasant. Even after I found the parts that were hitting each other I wasn’t able to determine what parts of the parts were making contact. I tried various sound deadening fixes like felt, molding tape and strong language. Eventually I hit the sweet spot and the noise was radically reduced. Zipping things back up was even more work than taking them apart but I got it done (and it was done right). One less noise in the cabin – easily the largest offender – has been eradicated! This makes me want to revisit my efforts to cap off the engine noise being pumped into the car. One day. Installation was a little tricky as my part required a slight modification (as have some of my other MACarbon items) but I don’t mind that stuff at all. The fuel door looks fantastic, and, in my opinion, it’s a part I would recommend to anyone who wants to shave a few ounces off their car (okay, it is lighter but that’s obviously not why you’d get this part). You win some and you lose some! I’m still looking for better door sill replacements (maybe non-illuminated). If you come across some shoot me a link. In the end what’s an extra month or two? 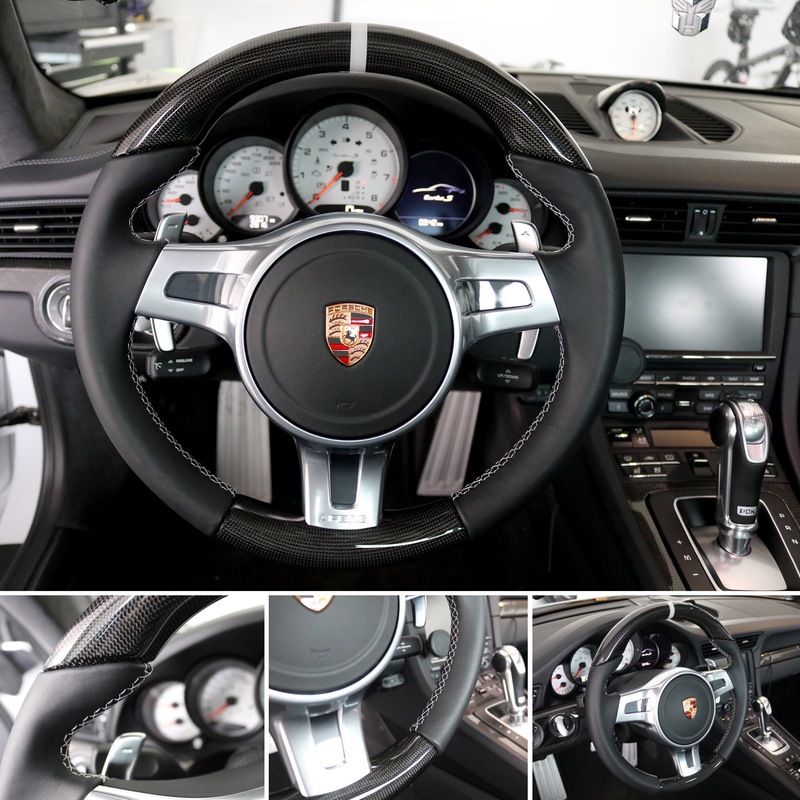 This kind of stuff isn’t a big deal and I am very impressed by the way TechArt stepped up. In fact it makes me feel extra good now to have TechArt products adorn my car. Even though this isn’t a high contrast addition (it sort of disappears into the valence) I still think it looks excellent.